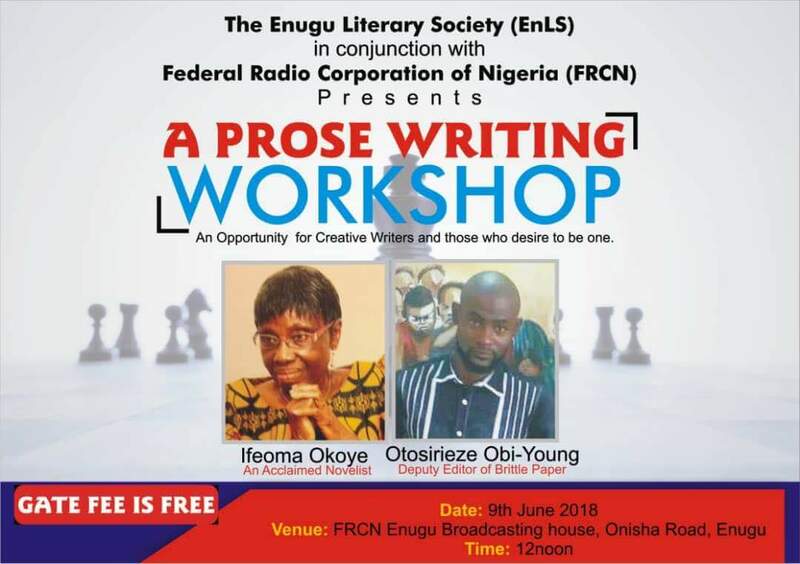 The Enugu Literary Society (EnLS), in conjunction with Federal Radio Corporation of Nigeria (FRCN), presents a prose writing workshop onSaturday 9th June 2018, from 12pm, at FRCN Broadcasting House, GRA, Enugu. EnLS is an association of creative literati dedicated to the promotion of a literary renaissance in Enugu. 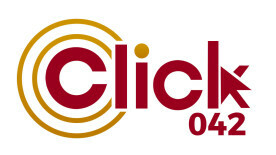 Founded in 2016, the group holds regular Open Mic readings, BookJam (Guest Author session), Writing Workshops, Literary competitions and on-air literary programmes. This is the second in the series of 2018 workshops and our resource persons are Ifeoma Okoye and Otosirieze Obi-Young. IFEOMA OKOYE, a prolific award-winning writer and an academic is a novelist and the author of The Fourth World (2013), Nowhere to Hide (2000), Chimere (1992), Men Without Ears (1984), Behind the Clouds (1982), Village Boy (1978). She also writes short stories among which are- ‘Trial and Other Stories’ (2005), ‘Waiting for a Son’ (1999 – 2000), ‘The Pay Packet in Touch Stone,’ (Spring, Texas 1991 and in The Heinemann Book of African Women Writing), ‘The Power a Plate of Rice’ (In Opening Spaces: An Anthology of Contemporary African Women’s Writing, 1999 and also in Breaking the Silence: An Anthology of Short Stories by Women Writers of Nigeria, 1996. Translated into Spanish). She authored the following children stories- Chika’s House (1995), Ayo and His Pencil (1995), Neka Goes to Market (1995) and many other stories. A winner of several awards including African Regional Winner, Commonwealth Short Story Competition, for ‘Waiting for a Son’ and Best Novelist of the Year Award by Association of Nigerian Authors (ANA) for Men Without Ears, she was until recently a lecturer at the Institute of Management Technology (IMT), Enugu, and at the Nnamdi Azikiwe University, Awka, Anambra State. She has Bachelors Degree in English at the University of Nigeria, Nsukka and a Master’s Degree in Teaching English for Specific Purpose from Aston University, Birmingham, United Kingdom. Otosirieze Obi-Young is a writer, an academic and the deputy editor of Brittle Paper. His fiction has appeared in the Threepenny Review (“Mulumba,” 2016), Transition (“A Tenderer Blessing, “ 2015), and in an anthology of the Gerald Kraak Award for which he was shortlisted (“You Sing of a Longing, “ 2017). His work has also been shortlisted for the Miles Morland Writing Scholarship in 2016 and Pushcart Prize in 2015. He attended the 2018 Miles Morland Foundation Creative Waiting Workshop. He is the curator of the Art Naija Series, a sequence of themed e-anthologies of writing and visual art exploring different aspects of Nigerianess. The first, ENTER NAIJA: THE BOOK OF PLACES (October, 2016) focuses on cities in Nigeria. The second, WORK NAIJA: THE BOOK OF VOCATIONS (June, 2017) focuses on professions in Nigeria. Otosirieze studied History and Literature at the University of Nigeria, Nsukka and is currently completing a postgraduate programme in African Studies and Pop Culture. He teaches English at Godfrey Okoye University, Enugu. He has completed a collection of short stories, YOU SING OF A LONGING and is currently working on a novel. When bored, he just googles Rihanna. This is not a workshop you want to miss if you are keen on being a creative writer as it promises to be informative, instructive and enriching.